Fox DVDs To Include iTunes Compatible Digital Copies? 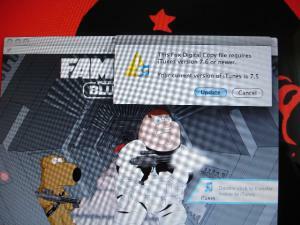 MacRumors reader mr echo received an early copy of a Family Guy DVD intended for release January 15th and discovered an included iTunes/iPod compatible digital copy. Also reported on TUAW. Previously, digital copies included with DVDs were encoded in protected Windows Media format, making them incompatible with the iPod or iPhone. However, indications are that both WMV and H.264 (iPod/iPhone compatible) digital copies will be distributed. Including a digital copy on the DVD makes ripping the DVD for use with portable media players largely unnecessary, although the files are likely to contain digital rights management. The H.264 copies reportedly require iTunes 7.6, which isn't yet available. However, we had previously heard that iTunes and QuickTime updates would be coming by Macworld.